It’s amazing that you have not just one, but two highly reputed scholarships. How are you feeling about your achievement? I’m very happy, obviously. It made me more energetic and confident in myself. I feel more motivated and my passion for computer science was reinforced seeing so many amazing people working in this field. I am most happy when I see the joy in my parents, who were celebrating my achievements and articles about me in news papers. It is one of the times when I saw them the happiest ever. These scholarships are highly sought-after. What kinds of application and selection procedures were involved? 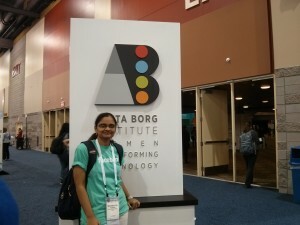 At the Grace Hopper Conference (It is organized by the Anita Borg Institute, and hence that board in the background). For the Google Anita Borg scholarship , we had to first submit an application which included a resume and a few essays like we do for any other scholarship. After shortlisting applicants based on that, they held phone interviews that had both technical and non-technical discussions. The technical questions were very interesting but fairly easy and the interviewers were very open to out-of-the-box solutions. Apart from technical problems, they asked about my background and were very surprised when they learnt that I hadn’t learned Computer Science until coming to college. For the Facebook Grace Hopper Scholarship, we needed to submit a resume and some essays but there were no interviews as such. The application process happens quite early since the selections take time. If the conferences happen in September or October, they take applications during April or May. So don’t miss the deadline if you’re applying, it’s quite early. How did you come to know about these scholarships? What kind of assistance and guidance did you get from your professors and seniors? expanded into the Asia Pacific region. I was hesitant to apply because I never thought I’d get it. It was Ravindran sir who pushed me to apply. Kirtika helped me a lot with the application. She has been helping me throughout my years in insti and is someone I approach whenever I need advice. 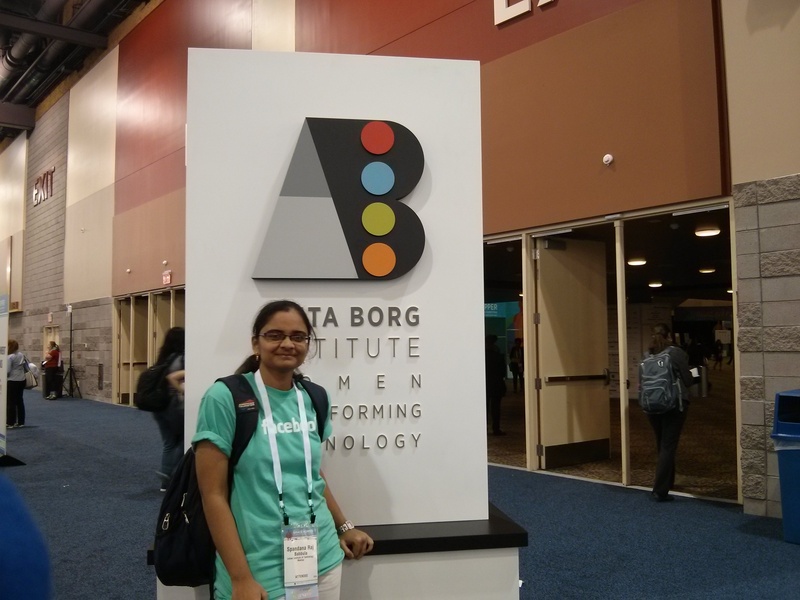 I was happy to meet her at the Grace Hopper Conference as well. The Facebook scholarship information was forwarded to all my batch mates and juniors by Sujeet Gholap, who interned at Facebook. I heard from other sources as well but this is what I remember. What do these scholarships offer? The Facebook scholarship is given to 25 people all over the world. 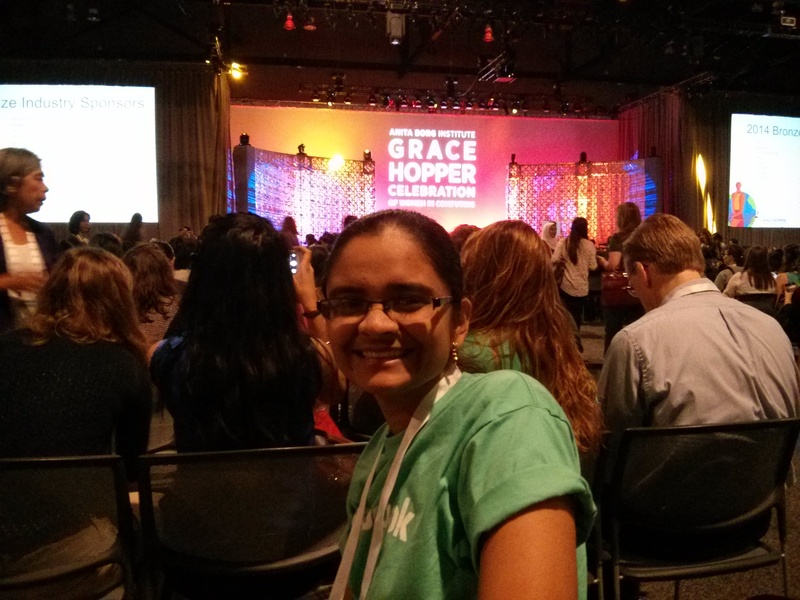 It offers complete funding to students for attending the Grace Hopper Conference, which is a very big event. There are others who offer similar scholarships as well. Facebook, in addition to the funding, organizes a two-day session of interactions, panel discussions and technical talks. The Google Scholarship is more prestigious since the selection process is difficult to get through. 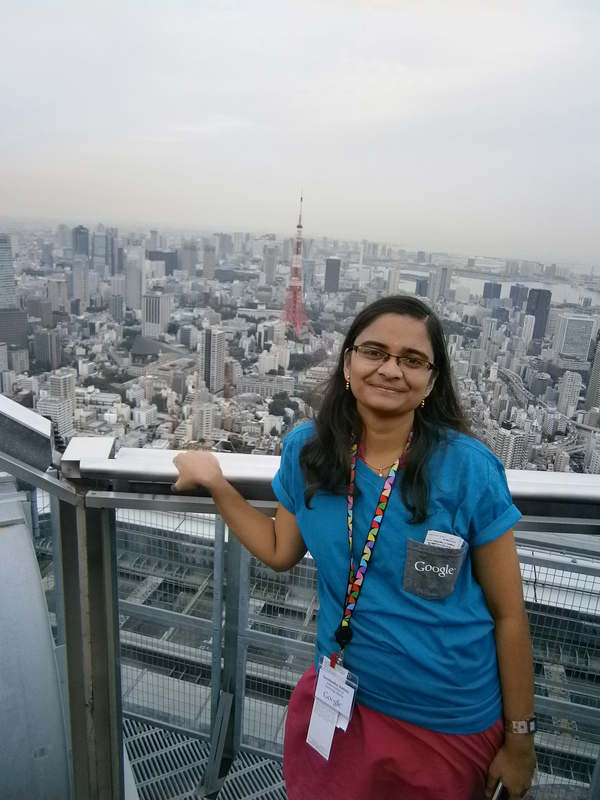 They award a scholarship of 1 lakh rupees in addition to a company retreat in Tokyo. Tell us about your interest in computer science. Did you know that this was what you wanted to do before coming to insti? I formally learnt about Computer Science and programming only after coming to college. I knew what a computer was and I knew how to use it but I didn’t learn Computer Science in 11th and 12th like a lot of other people here. I was generally interested in computers; we got a computer in my house around the time I was in the 9th standard. From then onwards, I just started exploring its uses and it always fascinated me when I thought about what happens inside this box. I loved math and puzzles too, and I think all this contributed towards my passion for Computer Science. How was your experience at the two conferences? Do you have any interesting stories that you want to share with our readers? The Google retreat happened at the Google Tokyo office and was attended by quite a few people in important positions at Google. We met two VPs, one of them VP of Engineering Operations in the Asia Pacific region. The other was Stuart Feldman, someone who has seen Computer Science develop since its very beginning. He was an author of the very first FORTRAN compiler and is well known for writing the “make” program. Their rich experience made their speeches very inspiring. There were also panel discussions where we could ask the Google representatives all kinds of questions. When people asked them what makes Google so special, they explained to us why it is doing so well. They hire the best talent, work on the latest projects and ideas, and are ready to “Fail Fast”. They bring their projects to a workable level, send it out to users, and keep making changes according to the feedback they get instead of working vigorously for months on a project before releasing it. They also have something called the “80-20 formula”, which in essence means that employees have to spend four out of the five working days on the projects assigned to them, and they can work on any project of their own on one day. A lot of amazing products like Gmail and Google News have come out of these independent projects. Apart from technical talks by many other speakers, Networking and Leadership sessions were conducted. There were 27 winners of the scholarship and everyone had very different ideas, making for interesting discussions. These sessions gave us an opportunity to learn what the others are working towards. They had so much passion for Computer Science that just talking to them was very inspiring. There is so much energy when you are meeting such people who are doing well in their fields, and after coming back, I feel even more motivated to excel. More importantly they were all women. In insti I never feel this difference while working on projects or in class, but what happens in the industry is that just about 15% of the employees are women and the companies really want to change this. They want to improve their diversity as better ideas come out of a diverse set of people. A lot of tech companies are working towards this now, and programmes such as this scholarship, where they identify and reward talent, are an important part of this endeavour. At the Google retreat, apart from rewarding talent, the idea was to have us chart out plans that could be implemented in the coming years to improve awareness of technology right from the school level. This is very difficult except in big cities like Chennai and Hyderabad. Most schools in small towns and villages do not have very good infrastructure in this respect. For example, I did not get much exposure in my school; I learnt Computer Science only after coming to IIT. So taking an active initiative in creating interest in technology is very important as it might lead to more students entering these fields at higher levels. There were also discussions on increasing awareness of the uses of technology among the general population. However, the main focus was on improving women’s presence in technology. There were some very inspiring female speakers. I remember that one of them was the first female Computer Science graduate from the IIT’s. 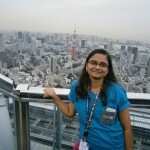 Her story is quite amazing: after IIT Kanpur, she studied at Stanford, worked with and even started several startups and is finally working at Google now. There were also talks by previous winners of the scholarship. A lot of them mentioned that after winning this scholarship and the recognition that goes with it, they felt a lot more confident and that it gave them a lot more drive and energy. It wasn’t all serious stuff. We had a lot of fun; we went sightseeing around Tokyo and had a ferry trip as well. very good opportunity to meet a lot of people. Everyone is very open and you can just walk up to them and start a conversation. There were women from all fields of Computer Science: developers, researchers, employees from many different firms. There were a lot of technical talks, where some new idea is introduced or a paper is presented, just like at other conferences. The leadership talks were amazing. It was very inspiring to see the kind of people who were giving the talks. We had Megan Smith, the Chief Technical Officer of the USA as a special guest, and Shafi Goldwasser, a Turing Award winner giving a talk on cryptography. There was also a bit of controversy at the conference when Satya Nadella was being interviewed by educationist Maria Klawe, who is also a Microsoft board member. Klawe asked him what advice he would offer women who are not comfortable asking for pay raises. ”It’s not really about asking for a raise, but knowing and having faith that the system will give you the right raise,” Nadella replied. The statement seemed fine to me, but later when I read it in the papers it looked like a statement “Women shouldn’t ask for a raise”. That aside, he spoke about the future of Microsoft and stressed that Cloud Computing is the next big step. And then there was the Career Fair, which is a big attraction at the conference. While the long process of job placements cannot happen then and there, it is a very good opportunity for students looking for internships. There are a lot of on-spot interviews and offers. I was planning to ask my juniors to attend this. They’ll need to get funding to get there as it always happens in the US, but it would be extremely useful to go there in your second or third year. An Indian Grace Hopper Conference is also organized every year, usually in Bangalore. It’s not as big as the main conference but a lot of people do attend this one as well. I would encourage people to attend it as it is a very good opportunity for networking and building contacts. Both scholarships are given in honour of two of the greatest women in the field of computer science. What’s your take on the issue of women (or lack thereof) in technology? It is a well-known fact that the number of women in technology is very less. Even here in IIT, it’s visible: just about 10% of the students are female. I am not sure why this is so. There could be various reasons. I don’t know what happens at the college level, but at the job-level women have various other responsibilities and commitments, childcare being the single biggest one. Many women take a break; some do not come back to work because they may not be able to manage things as well as they would want to. Even those who do come back probably will not be able to put in as much time into work as men. This also came up in the interview with Satya Nadella that I mentioned. The interviewer Klawe suggested that steps be taken to welcome women who are re-entering the field after a break. I think this is a very good idea. Women who take a break of one or two years to take care of their family should not feel hesitant to start working again. There should be someone to give them a hand of support. I think companies are very aware of these issues and are implementing such measures. Work-home balance is quite difficult for women, and the firms do have their eye on this as well. They admit that employees are dissatisfied with their work-home balance and have expressed this as well. These are common problems but still there are women who have overcome these problems and have reached the peak. Seeing and meeting so many women like that made me believe that anything is possible. We’ll just have to manage our time well. I don’t think we have to remind ourselves of any difference. Everyone has their own commitments and restraints, but still people do well. So everything is possible, and we need to move forward with this in mind. As you mentioned, the number of girls in IITs still remains low. What kind of initiatives do you think should be taken to resolve this problem? I actually can’t understand why it is so low and find this very strange. There were many girls studying with me initially at my coaching centre but in the end I was the only one who made it to IIT. On the other hand a lot of guys did get through. I really don’t know what is happening at the school and college level. I haven’t seen enough of the world to answer this question but if you work hard, your gender doesn’t matter, you can make it. I strongly encourage my juniors to attend such conferences. Of course, you shouldn’t do this to bunk class. To repeat, keep an eye on the deadlines as they are quite early. Spandana Raj is a final-year Computer Science student at IIT Madras. For this year’s placements, she bagged a spot at Google.